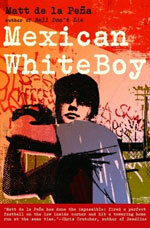 Mexican WhiteBoy by Matt de la Peña is gritty. It’s real and it’s tough. It a gives a glimpse of life in a poor Mexican barrio near San Diego. 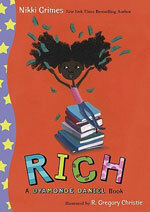 We see it through the eyes of Danny, a mixed-race teenager trying to come to terms with his mixed up identity. His mom is blond and blue eyed, his dad is Mexican. He feels out of place at his white private school and in the poor neighborhood his dad grew up in. But his dad is gone. His mom is off in affluent San Franciso with her boyfriend. Danny’s left with his extended family, where he doesn’t quite fit. We also see the neighborhood through Uno, another mixed race teen—black and Mexican—who also struggles to find his place. Yes, every teen novel is about self identity. Who am I? What’s my place in this world? But it’s that much more acute for these characters caught between borders. But Danny loves baseball. Unexpected friendship and the love of the game find a way through. There’s a lot going on in this book. The questions of culture, race and identity are powerful. At the same time, it reminds me of all the books on baseball I read as a boy (probably during the height of my baseball addiction, just after getting baseball wallpaper). Like Hang Tough, Paul Mather. Alfred Slote was the king of YA baseball stories. At some book sale I remember finding a signed copy of a Slote baseball book, inscribed to someone and dated 1981. I thought that was pretty cool. I don’t remember much about Slote’s baseball stories. But the descriptions of the game were good. Mexican WhiteBoy doesn’t even include any games, but Matt de la Peña’s descriptions of Danny’s pitching are just as good. 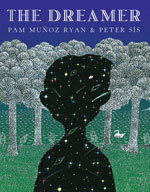 The Dreamer, written by Pam Muñoz Ryan and beautifully illustrated by Peter Sis, is the story of the childhood of poet Pablo Neruda. He was an absent-minded dreamer struggling with an authoritarian father. It’s full of wonder, but it really feels like a mere introduction. I wanted more. And I should confess I’m not into poetry. I preferred the details on Neruda’s life than the excerpts of his poetry. Shifting gears, what most struck me about this story was the scatterbrained boy and the frustrated father. I saw myself in that father, pushing his son to stop dawdling, to hurry up, to focus. Hopefully I’m nowhere near as authoritarian and rigid as Neruda’s father, forcing his son into the ocean until he learned how to swim and burning his writings. But the frustration, the lack of patience, the quick dismissal—they feel too familiar.